We’ve moved to our first storefront location at 123 N. Foster St. in Dothan. We’ll still make and serve our pops and homemade waffle cones filled with delicious Blue Bell ice cream. We have also added a quick service lunch featuring soup, sandwiches, and salads. Quick lunch will be available 10:30am to 2:00pm and “Parlor Hours” will follow 2:00-5:00pm. We’ll enjoy extended hours until 7:00pm during the Summer months. Contact us to schedule your personal evening ice cream party at Stix & Cones. It’s a small, intimate space with seating for up to thirty-nine people, perfect for a family birthday or anniversary celebration. Children can enjoy making their own sundaes, while adults can enjoy eating the ones we make for you. We have two ice cream trikes, two smaller carts and one large cart. This is a fun way for you to entertain guests and get to enjoy your party yourself. This includes one of our carts or trikes, a happy-to-be-there attendant, and up to 80 pops. Each appearance lasts one hour. Business can also enjoy increased traffic with us as customer incentives, appreciation, or attention-grabbers. Our dozens are packed in corrugated boxes. Weddings are a great place for pops or cones. Look at our Wedding Gallery for a photo gallery of past events. We can match the color of your event. Reserve your special date now for a non-refundable 50% deposit. Find our product right now at the King Drug in Samson, Grafitti's Pizza Joint in Eufaula, AL, Todd Farms in Headland, AL, Tri-County Feed and Seed in Graceville, FL, and locally at The Thirsty Pig, The Cellar and Landmark Park. We are available to your qualified businesses for wholesale. 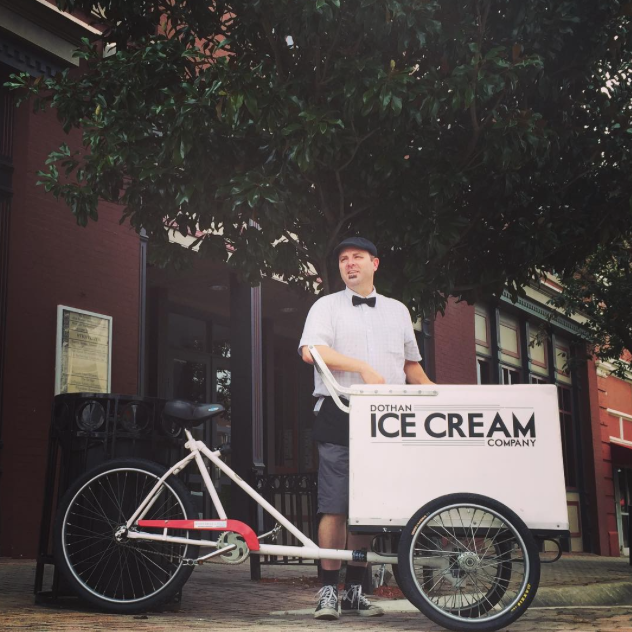 If needed, we can provide a freezer, Dothan Ice Cream branding, and promotional materials. Contact us today to bring Dothan Ice Cream to your shelves. Price breaks are available for larger quantities. Our price breaks are at 250, 500, and 1,000 pops. If you're interested in providing your large group with awesome pops, please contact us right away. Shipping is not yet available.